The LiveEngage messaging platform enables brands to provide a continuous connection with consumers, creating the personalized, convenient level of service people expect today - straight to their mobile devices. 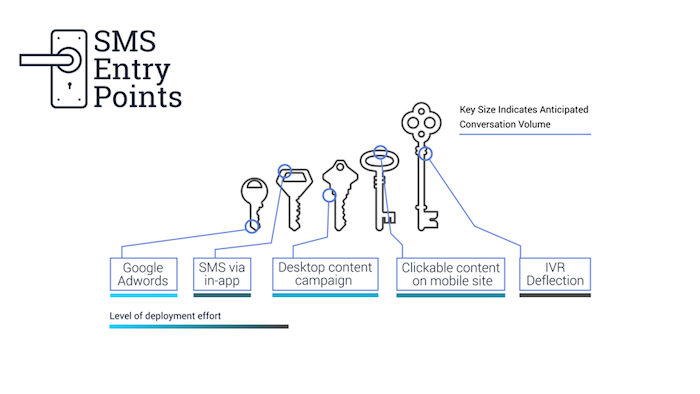 The LiveEngage SMS solution provides brands with multiple entry points for their consumers, whether it’s IVR Deflection to SMS or Google AdWords Click-to-Message. The key to the best SMS experience for both brand and consumer is choosing the best entry point(s). Where is your consumer traffic? Are your consumers active in your app? Are your consumers busy calling a 1800 number? By choosing the best entry point(s) brands can ensure that SMS engagement will be an effective channel for meaningfully engaging with consumers. This document is a comprehensive guide for all the LiveEngage SMS entry points. If you are interested in configuring a specific entry point, skip ahead to that specific section. If you are just interested in reading about an entry point, explore the document and feel free to jump between sections. Scale - manage an SMS program effectively at scale in one platform along with all other messaging channels. Operations - with the LiveEngage platform brands can track operations in real time and report on volumes, effectiveness, agent efficiency and much more. Higher CSAT - brands see higher satisfaction among their consumers when using messaging as their channel of choice. Ease of use - your consumers don’t need to download any additional apps or enable any preferences - they will send and receive messages from the native SMS app that already lives on their mobile. Targeting - intelligently target and engage your consumers where they are by using the LiveEngage targeting capabilities. Expand your reach - engage consumers from multiple entry points in order to reach more consumers than ever. For best practices and considerations regarding security and architecture please see the LiveEngage Out-of-the-Box Connectors Overview and review the SMS section. There are specific legal considerations that a brand needs to think about when implementing SMS. For full details please reference this Best Practice for Complying with Text Messaging Regulations.